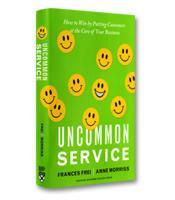 With the title of their introduction, Francis Frei and Anne Morriss, authors of Uncommon Service, capture how most of us feel about today's customer service: "If This Is a Service Economy, Why Am I on Hold?" Indeed, it seems that technology has only allowed companies to be less service-oriented than before. Have you tried to call a bank lately? 1. You can’t be good at everything. 2. Someone has to pay for it. 3. It's not your employee's fault. 4. You must manage your customers. The authors begin developing the four elements of their deceptively simple framework with a provocative statement: The great customer service organization must first decide to perform poorly in some areas. The idea of accepting poor performance is counterintuitive to most managers; the concept of deciding to perform poorly is almost revolutionary. Yet, the authors argue convincingly, deciding to perform poorly in some areas is the only way to ensure excellent performance in other areas. The reason: "You can't be good at everything." The fact is, most companies do not have the money, time or personnel to excel in every facet of their operation. As a result, they are mediocre to (at best) relatively good at some things and mediocre to poor at other things. For example, one of the most frustrating characteristics of banks is what is known derisively as "banking hours." These are the hours that banks are open — hours that correspond exactly to the times that most people are at work and cannot get to the bank. Commerce Bank [Acquired in 2007 by TD Bank] created a business model that eliminates this maddening feature of the banking system. In addition to regular workday hours, Commerce Bank branches would be open in the evening, all day Saturday and all day Sunday. A great idea... except those customer-friendly hours are very expensive. So how did Commerce Bank pay for all those extra hours? By saving some significant money in another function of the bank: return on deposit. Commerce Bank offers, locally, the worst returns on customer deposits. It believed, however, that the return on deposits would be less important to customers than the extra hours. The insight of knowing what customers care about most is the key to successfully performing poorly in one area in order to perform exceptionally in another area; the authors call this "bad in the service of good." After their unique take on the service offering — specifically, the dimensions that your customers value most and on which you'll be over performing — the authors lead the reader through the other elements of their model. First, the authors explain the four ways of funding a premium service: 1) get customers to pay extra for the service; 2) reduce costs in ways that improve service; 3) improve service in ways that also reduce costs; or 4) get customers to enjoy serving themselves. The third element of the model is employee management. In this area, the authors emphasize that the goal is to create an organization that — through the right selection, training, job design and performance management systems — helps average employees deliver outstanding results. Finally, the authors emphasize that customers themselves play an important role in the service that they receive. The best companies, the authors argue, know how to manage "customer-operators" to the benefit of everyone. Written by a Harvard Business School professor and a consulting firm executive, Uncommon Service offers a crystal-clear framework for creating high quality service that is at once simple and comprehensive.